Last summer, I found a great screen for an even greater price, and made it mine right away... 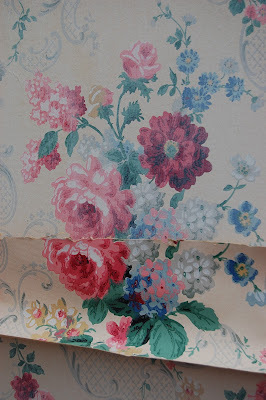 It was painted white, but I had plans to cover it with some beautiful vintage wallpaper I had been saving for just the right project. Once glued to the screen, I wanted to give the wallpaper a worn, faded look, so I brushed it with Ralph Lauren Sunfade Glaze (found at Miller Paint). I really love how it turned out! Then, a few weeks back I came across a picture from an Anthropologie store, and I was smitten by an old screen repurposed as a clothes rack.... I realized I could do something similar with my screen! I had my husband cut a piece of curtain rod and attach metal hooks at the ends. I love that I can use this as a portable wardrobe, at shows or even at home, and then put it away flat when not in use... And the screen can still be used as a screen! If you don't have a screen, you could make your own, with old doors or even shutters.. Just make sure to use the kind of hardware that allows the doors to fold in both directions. And you can use just three panels, instead of four, like mine... It will just be smaller. 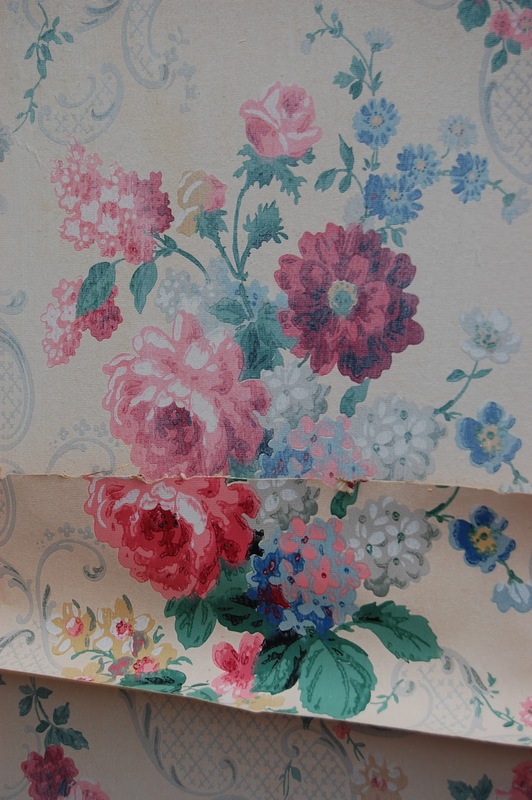 Also, if I wish I can reverse it so the floral part is on the outside, depending on what side is viewed the most! This was a fun project and I hope it has inspired you to think outside the box!! My goodness but those dresses in your wardrobe are simply glorious!! Fantastic idea! I have a bunch of old bi-fold closet doors I was looking for a project for. We are having our annual yard sale this spring and I needed some place to put all of the vintage dresses. Thank you so much for posting this. It's beautiful! Isabel, that is both brilliant and gorgeous!!! p.s. 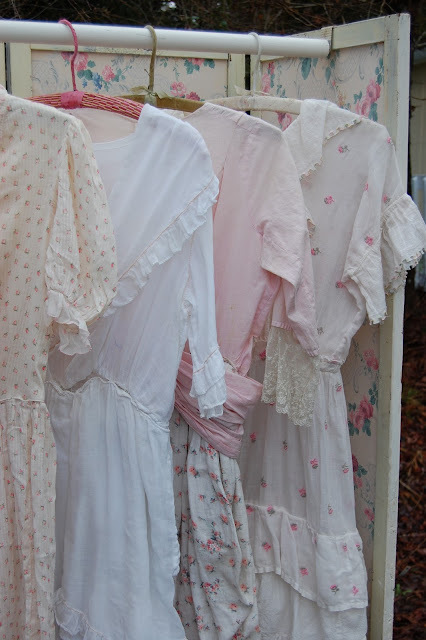 love your vintage dress collection too! That is so beautiful! 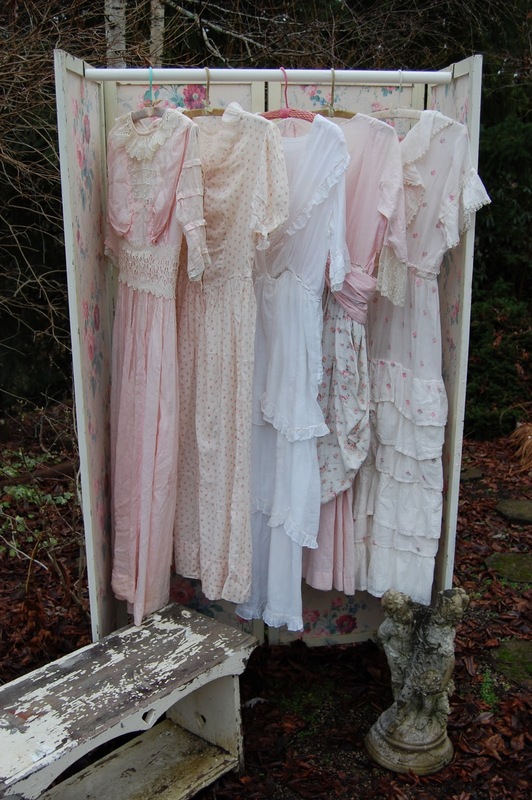 What a great idea to display my vintage clothes at sales! Isabel, you have the MOST charming, exquisite style. So charming! Brilliant! I wish I had a laundry room big enough to put such a screen in. Then I could air dry some clothes on "the line"...:). Or it would be darling also in a little girls room......thanks for sharing the idea. 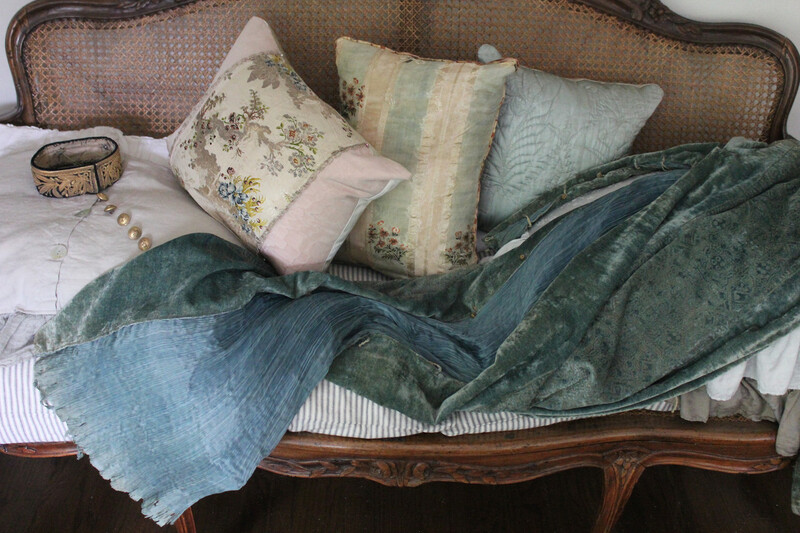 Absolutely gorgeous - soft and romantic. A picture worth a thousand words. That is so sweet! And your dresses are so pretty. That looks fabulous; I love the faded wallpaper! Love your screen but can't stop looking at the dresses! que lindos vestidos! tão romanticos! e a ideia é excelente! This is so beautiful and practical too! That ageing glaze is very clever. Oh Isabel, your project turned out so lovely! You always have the best ideas. I love this Isabel! It turned out great! Absolutely fabulous! Pretty, useful, and practical....what more could one ask? That piece is so very pretty and I'm inspired now to do something with my tri-fold screen that's been collecting dust in the attic for years! SOOOOO pretty! Thank you for your sweet sweet comment too, my dear. That is amazing...love how it turned out. You did good. That is a beautiful result! 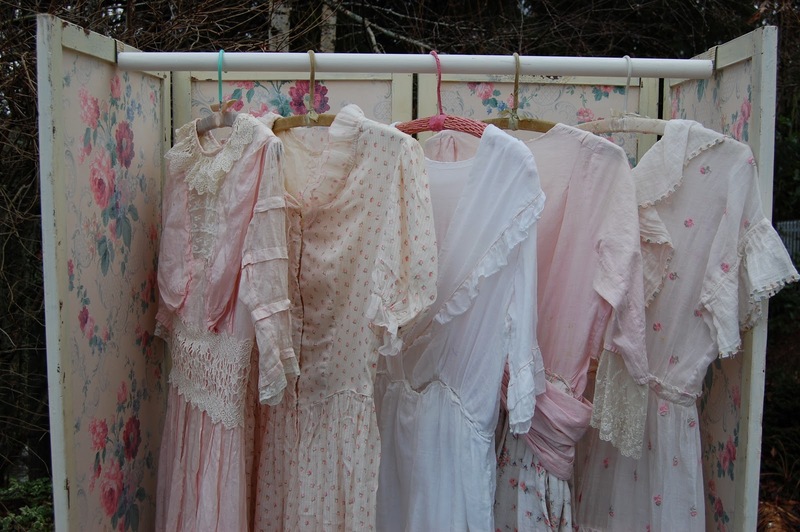 I love the faded wallpaper and the vintage dresses. How pretty! Thanks for stopping by my blog. 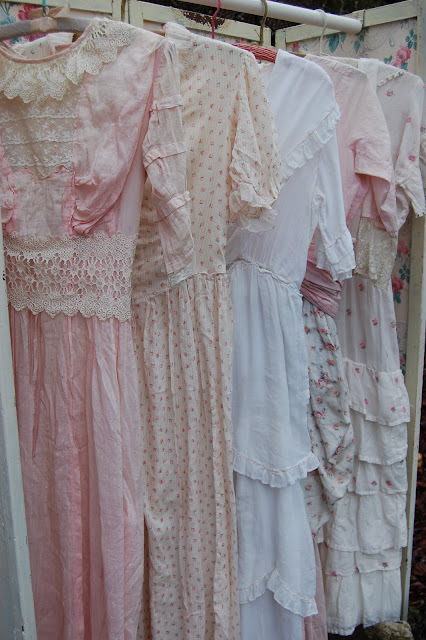 I found your Mom's linen closet picture on your Flickr pics. I love it! It is beyond perfect! I wish I had seen it before I wrote the post, I would have asked to borrow it. BTW, I love your blog, it is so pretty. 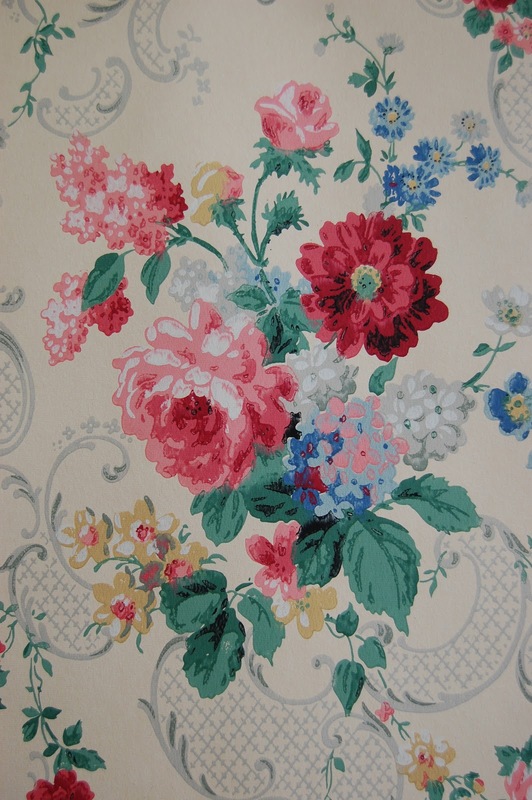 I love the flowered paper design you used on the above post. Those dresses are to die for. Une très bonne idée... si romantique ! Bises de Provence. This is amazing! Your vintage dresses are beautiful. Super excited to see your article in Somerset today! ;) Nice to see a local featured! Love to see the fun us "gatherer's" do with pretty much nothing! Great idea and it is beautiful! That's a clever use Isabel and so pretty with you vintage clothing! I just love this idea. I love your blog too. You have so many wonderful ideas. I'm gonna have to back and read it all. 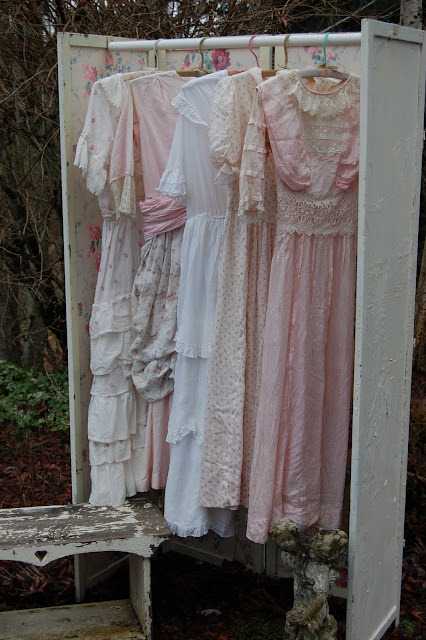 The project is wonderful, Isabel, but THOSE DRESSES!!!!!!!! They are super- cute!!! Do you actually WEAR THEM???? Thinking of you very often, and of what you shared with me a while back ;) Thank you for your sweet friendship! Oh I meant to say, last night I finnally had the pleasure of reading your article in Somerset life. You gave me chills! I really, really understand your feelings. I love your screen! What a great display piece. 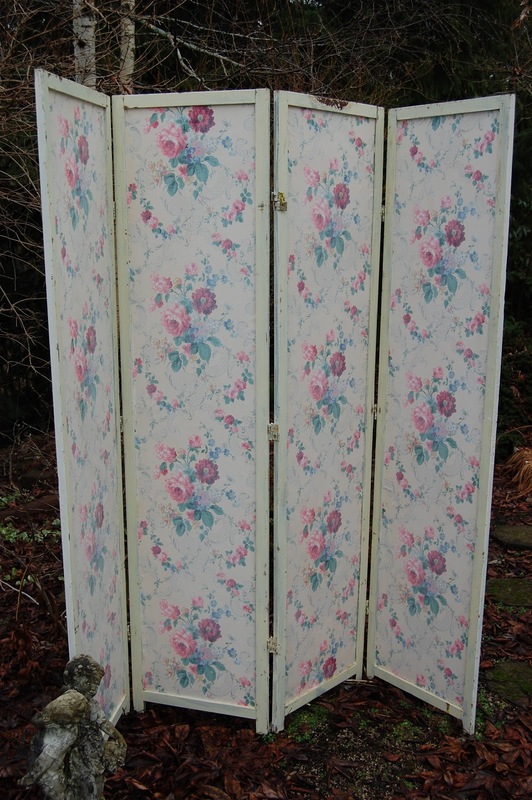 I just purchased a four-panel wood screen that needs to be painted, then I'm going to paper it with some flocked wallpaper I've been saving for a special project. Your finished project is really inspiring me to get going! Hi Isabel, I just fell onto your post and I absolutely love it! How creative are you?! And I mean that in a good way :) I'm a fashion student and I'm always in need of closet space. I also love to recycle any item! Thank you so much for sharing. 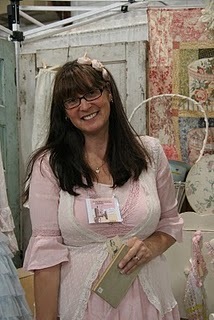 I have just spent forever going thru your blog, I just love it! I don't do show's so it is fun to live vicariously, I love your style I am going to be your newest follower! Don't want to miss anther post! I would love to wear those dresses! I bet they are so comfortable.